On May 14th, I finally managed to find the time to go to Hamamatsu and visit the largest Brewery in the Prefecture, namely Hana No Mai Brewery located in Miyakuchi, formerly part of Hamakita City, now merged into the new cosmopolitan City of Hamamatsu. To reach the place you have to board the train to Komatsu on the Entetsu private railway line just outside Entetsu Department Store and then take a taxi or walk for a good hour like I did. The brewery seems small at first glance., but the facade is cleverly designed to hide the vast complex behind. 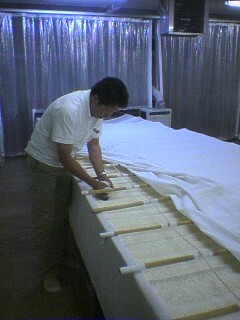 Mr. Kazuhito Tsuchida, the young (48) Toji/Master Brewer was expecting me and I must say that for the whole time I spent in his company, I felt extremely welcome. Mr. Tsuchida was born but followed his father to Hamamatsu when he was still at Primary School. We almost spent the same time in Shizuoka Prefecture, and although he does visit his homeplace from time to time, I felt he was truly a man of Shizuoka. 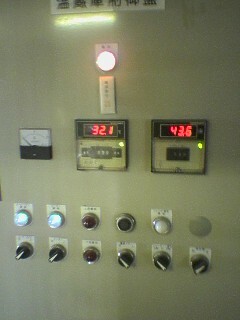 Actually, the only thing not from our Prefecture in the whole Brewery is the cedar ball “imported” from Gifu Prefecture! Hana No Mai was founded in 1864 and was called Inasa Brewery until December 1949. The Sales Department is under the responsibility of the last generation of owners’ son, Kazuo Takada. 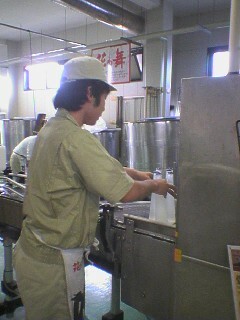 Mr. Tsuchida, who became the resident Toji at the age of 32 is now in charge of the whole brewing, while the brewing of sake is being delegated in great part to Mr. Jun Aoki (32). 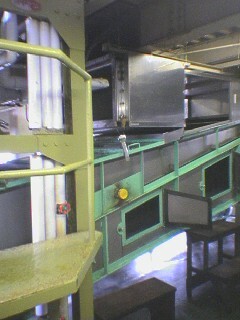 This is a Large brewery by Shizuoka standards as it numbers 65 employees with 10, including 2 ladies!, in charge of the brewing solely. Employees are of all ages, a sure sign of an assured future. 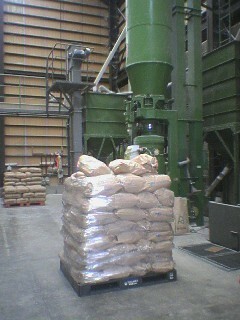 Rice strains are Shizuoka Yamada Nishiki, Homare Fuji, Shizuoka Goyakumangoku and Shizuoka Natsushizuka. 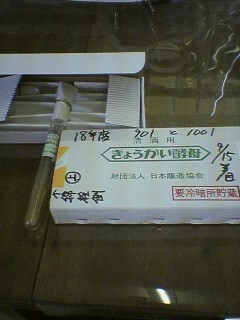 Mr. Tsuchida develops his own HD-1 NEW 5 and K901 (Shizuoka) yeasts. 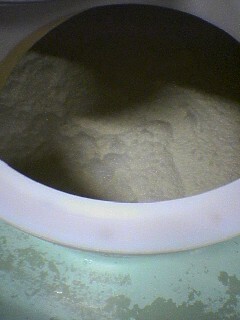 Alcohol is also made in our Prefecture. 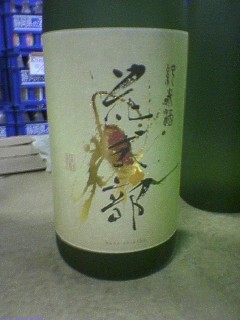 Hana No Mai has been brewing premium sake only since 1995. 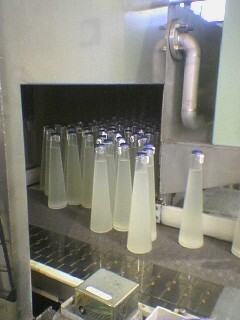 Thay have the license to distill kome/rice shochu of extravagant quality as well as umeshu from junmai sake. Hana No Mai Brewery is not only very open about their business but also generous in allowing everyone to take water from their well! It was a long tour indeed, and all the time it was made all the more pleasurable by a truly enthusiastic master Brewer who made a point to present me with plenty of o-miyage/souvenirs to take home. 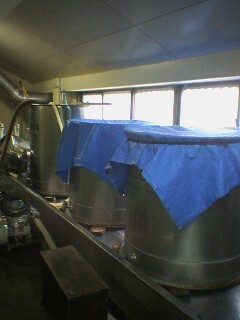 Hana No Mai Brewery presently exports to the U.S., Canada and Hong Kong. Another piece of good news, for collectors, as Hana No Mai Brewery brews more than 200 private brands for local businesses! Last, but not least, two sake brewed by Hana No Mai will feature in an international virtual tasting in New York, Tokyo and Shizuoka whose results will be silmutaneously published on the 21st of May by Melinda, Etsuko, Valerie, Timothy, Hiroko & Eric and your servant! Some call it grotesque, others beautiful. It earned its name because of it darkish red colour and bluish fins. 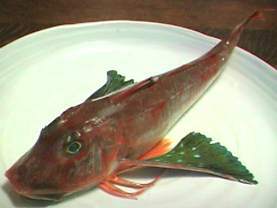 Most of them are found in Niigata Prefecture from in Winter (30~50 cm), but they are caught in early Spring in Suruga Bay (the Shizuoka variety is smaller, up to 20 cm). In “nabe” (soup pot) or as “nimono” (simmered) in Japanese-style cuisine. Steamed and served with a sweet and sour sauce in Chinese-style food. Cut the side fins and scrape the scales off. Clean the insides. Make a couple of shallow incisions over each flank. Fill the stomach with a mixture of finely chopped vegetables and herbs (leave your imagination free!). Put it on a large sheet of olive oil coated cooking foil paper, sprinkle it with a little salt and pepper. Place vegetables cut in long strings on both sides (plenty is fine), and one or two thin lemoon slices on top. Coat it with some (not too much) extra virgin oil. As a last touch, I add some white wine and a little anise spirit (Pernod, Ricard or Absinthe). Lossely envelop the fish with the foil paper, close both ends by twisting them around. Place the fish in its foil paer directly on the metal plate inside an preheated at 180 degrees Celsius and cook for about 15 minutes (longer for large fish). If you do not have an oven, steam it the Chinese way! 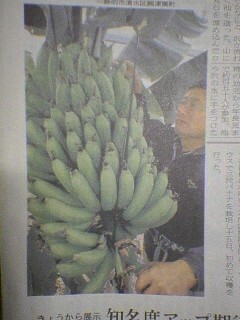 First harvest of bananas grown in Shimizu City. Mr. masao Yonezawa of Okitsu Higashi Machi, Shimisu Ku, Shizuoka City, has succeeded for the first time in our Prefecture in grrowing and harvesting the fruits of f the 3 “banana trees” ( a grass actually!) 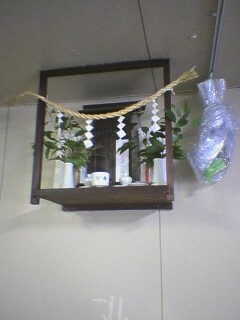 inside his green house (“vinyl house in Japlish). 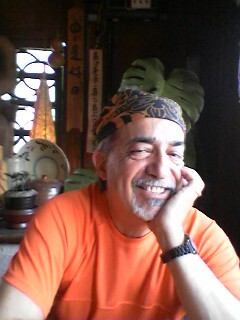 He first attempted the culure of bananas in November 2005. His crop was a total failure last year when the flowers refused to germinate. 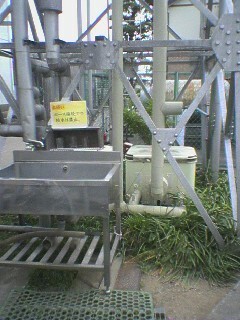 A JA member, he will exhibit the bananas at A Coop Freppie in Okitsu and hopes to start marketing them from next year. This blog will serve as an umbrella blog for already existing blogs for sake, shochu and sushi made and savoured in Shizuoka Prefecture, and all other aspects of Shizuoka Gastronomy, such as beer, liqueurs, wine (only one! ), restaurants, bars, produce and so forth!